She spent thousands of years locked in a mirror, unable to talk except to answer her captors’ questions, unable to tell either side she wasn’t the enemy. Escaping to Homeworld, they locked her up again. “Rebel, traitor,” they called her, and dragged her along as they abducted her only friend. To save that friend, she gave in to Jasper’s forceful advances in order to trap both of them under the sea, locked together as abusive lovers for months on end. She was practically shattered by the time the Crystal Gems saved her and gave her true freedom at last, but now the Diamonds are coming back. After the “Steven Returns” batch of episodes, Lapis found out Steven pissed off Blue and Yellow Diamond again. She freaked out and wanted to flee to outer space with Steven, Peridot, Pumpkin and the barn. Her friends didn’t want to go, so she ended up leaving with only the barn and everything in it. Lapis seems to have spent a lot of time vegging out in front of that TV. Steven Universe has shown scenes where Lapis pays little attention to what’s going on around her, just shutting herself off from reality as she zones out in front of that TV. Her sometimes-unkempt hair, the subject of a lot of memes, would also provide a clue that she may have tried disconnecting. But activities with Peridot, the Meep Morps and farming, kept Lapis from withdrawing into herself after her well-documented trauma. Wherever Lapis is, she’s probably hugging that alien stuffie and thinking of Peri. But fans haven’t seen that yet, and they have seen Peridot looking like this. 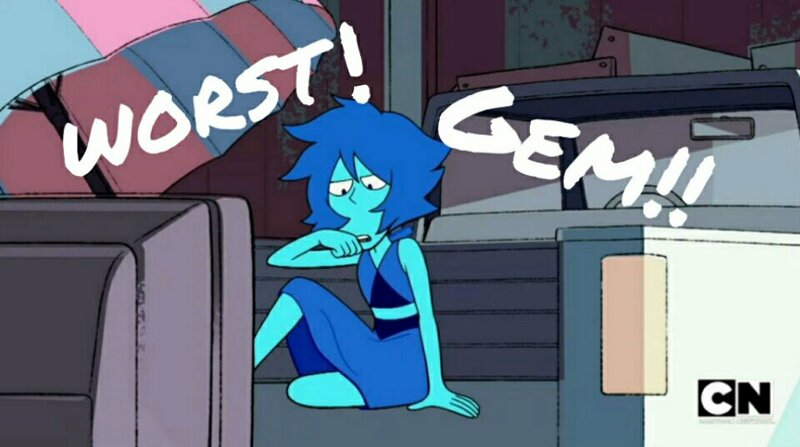 Lapis has had a history of being mean to poor Peri, Peridot might have been mean to her, but again, fans haven’t seen that. They did see Lapis crush Peri’s tape recorder and tell her to go away. While they may have forgiven her for that when they were together and bonding, Lapis’ absconding with the barn and all Peri’s things open up a lot of old wounds. But Lapis isn’t that bad. While a prisoner of Homeworld, she didn’t tell Jasper or Peridot about Steven. She may not have told Jasper about The Crystal Gems either; Peridot had seen them all before. Lapis certainly has some issues, and she’s been called “toxic” by some fans, but anybody would be. There are two people she cares about very much: Steven and Pumpkin. And possibly Peridot, which she may still prove later In the series. Given how TV shows typically go, she’s almost certain to return at some point to make amends for leaving. This will be when Lapis shows her heart again, and most fans will probably forgive her for stealing the barn. Other than that though, I agree with you. I certainly don’t hate lapis but I think her character could be improved a bit in the next episodes! Lapis is a very difficult character by design, having been so traumatized by millennia of tortures and torments that she’s barely able to function, let alone connect with other Gems/human beings. I’ve always read her as suffering from both PTSD and severe depression, neither of which makes a person necessarily pleasant to be around or easy to understand (even taking into account how pretty much everyone she’s met has mistreated or exploited her in some way). In that sense, I’m not surprised that a lot of SU fans dislike her or find her problematic. But I am disappointed at the lack of empathy these fans of a show built around understanding and accepting others for their flaws and imperfections express towards Lapis. Personally, I love her, and as someone who battles with depression, empathize with her in a way I can’t with most of the show’s other characters (Pearl excepted, perhaps). Mirror Gem/Ocean Gem were definitely the episodes where SU first really clicked for me, since she appeared so powerful yet so helpless and vulnerable that I found her instantly compelling. So, the claim that Lapis is selfish and mean and all that really rankle with me. Considering her state of mind, being selfish wouldn’t even occur to her. She’s spent her whole life being used and abused by others, so how on Homeworld can you blame her for not being the most cheerful or accepting person? Just…those fans seem to be missing the point of Lapis altogether. On the other hand, it looks like she’s returning to the show soon. So maybe we’ll get a more satisfying ending to her and Peridot’s character arc. Given Lapis’s past history, though, I’m not holding my breath. The fandom’s recent meltdown over Lapis in Raising the Barn is both frightening and ridiculous at the same time. I’m just glad there are still some people out there who understands what she’s going through. Lapis is my favourite. I see a lot of myself in her. Lapis running was completely in character and made sense for the story. Trauma, especially the one she suffered through, doesn’t go away just because you have a nice home and Peridot. I think Peridot understands that too, which is why she was just said that Lapis is gone and not so much about the barn. Lapis will eventually return though, but needs time to get through some stuff. Hopefully when that happens we’ll see a Lapis Peridot fusion. “Peridot, moving to some unknown corner of the universe, will have only her memories.” Do you mean Lapis?